Understanding Clip Status in DVR Examiner - DME Forensics Inc. Within the DVR Examiner Clip List Grid, there is a field for the “clip status.” If the filesystem you are processing with DVR Examiner has support for inaccessible/deleted files, the information on these files is viewable here. 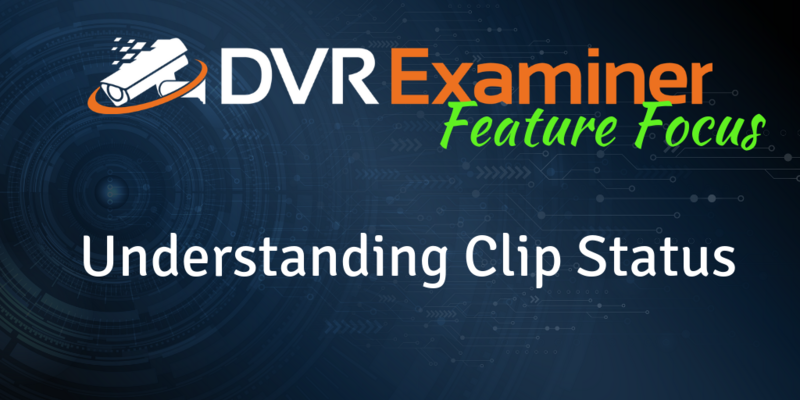 This field provides insight into how the clip is stored on the hard drive, and whether or not you are able to recover it with DVR Examiner by determining if the clip is available, accessible, inaccessible, partially inaccessible, or a clip fragment. Available indicates that a clip was found on the system and can be previewed and exported. However, DVR Examiner was unable to determine if the clip was accessible to the DVR through traditional viewing and exporting methods. Accessible clips were found on the system and determined to be accessible to the DVR. This clip (or time frame) is available for viewing and exporting from the DVR. Inaccessible indicates that DVR Examiner identified the clip, however, would not available using the DVR itself. A clip might be inaccessible for a variety of reasons (formatted DVR hard drive, deleted surveillance video, or partially overwritten video) but this means that the video is not properly indexed within the DVR system and as such would be inaccessible to the DVR. Partially Inaccessible clips are primarily accessible to the DVR, but DVR Examiner has discovered additional video and added it to the beginning or end of the clip. In most cases, this additional video would not be available using the DVR itself. Clip Fragments are clips that have been found but may be damaged or incomplete. These clips may not preview or export correctly. How Does DVR Examiner Recover Inaccessible Data? For some filesystems, DVR Examiner can determine the type of recording for recovered video clips. In these instances, DVR Examiner adds a “Recording Types” field to the Clip List Grid. These recording types include: continuous, motion/event, and scheduled. A Continuous recording type means that the DVR was set to be always on and recording video for that channel. In this case, you should be able to locate video clips for any time of interest. Motion/Event recording only occurs when the DVR senses motion based on its settings. While these clips might contain valuable video from your event of interest, often DVRs can be triggered by something as menial as the wind in the trees. Scheduled recording is exactly as it sounds. The owner of the DVR can determine a set schedule for the DVR to be recording video. Each of these clip status terms can help you identify details about how the owner set up their DVR, and why specific time frames may or may not be available for viewing. If you find yourself needing a more in-depth causality analysis into the video you are recovering, reach out to our Advanced Technical Services department.